I was initially diagnosed with cervical cancer 10 years ago which was treated with surgery, followed by 6 monthly check ups. After 10 years of check ups, I honestly thought my ordeal was over. However, in 2015 and 2016 I suffered from an episode of cellulitis. At this point no connection was made with lymphoedema. Then, in 2017, I noticed my right foot and leg became progressively more swollen, to the point that I could no longer fit my clothes on, or my shoes, and I couldn’t do my boots up. Driving and walking, sitting and standing for any time became painful and difficult. 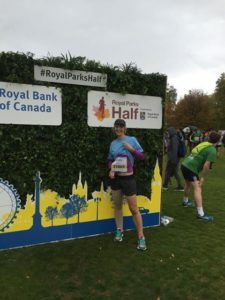 Battling with the NHS system for a diagnosis became a lengthy and tiresome process, but persistence paid off and in June 2018 I was eventually diagnosed with lymphoedema. I was told that lymphoedema is an incurable chronic lifelong condition and without proper management it can result in infections, disfigurement, pain and disability. Anyone who knows me will know I am a hardy soul, resilient and down to earth. But this was a real blow to take. It was painful to walk or drive and sitting at my desk was incredibly uncomfortable as my limb became bigger and bigger. I was embarrassed about my disfigured leg and disappointed by my body letting me down. I desperately missed running too which was always something that was there for me, for clearing my mind and refreshing my soul. Unfortunately, I received very little help after my diagnosis and the professionals to seemed to have very limited knowledge about this condition. It was upon doing my own research that I came across Star Throwers and specifically their lymphoedema therapist, Tina. The day I came to Star Throwers and met Tina was a game changer. I was greeted with unconditional care and kindness, all of the staff there made me feel supported and no longer alone. I cannot find the words to describe their kindness and care, from every person who works there. Tina in particular has been an absolute lifeline to me. Her knowledge of the condition is so far beyond what I had experienced to date. She provided me with not only a shoulder to cry on but also the most amazing expert help, guidance, advice and management for my leg and the condition. She was also absolutely uplifting from the first moment I met her and has given me confidence to live with this condition. It is incredibly hard for me to summarise this distressing journey that I have begun and the wonderful kind support and help that Star Throwers have provided me, just in one short story. I can honestly say that without Tina and Star Throwers, I don’t know where I would be. On my low days I still feel like this, but I now know I am not alone. 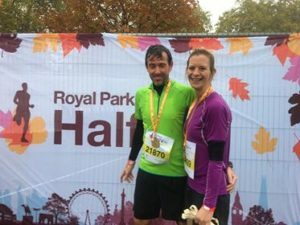 As my way of giving something back, I decided to run the London Royal Parks Half Marathon on 14th October. They were struggling to fill their charity places on this run and so I put myself forward and I wanted to also use it as a platform to raise the profile of Star Throwers and raise awareness of lymphoedema. 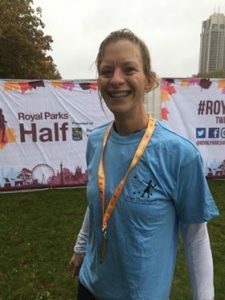 I’m delighted to report that, in spite of my lymphoedema which makes running even more difficult, I managed to complete the Half Marathon in 2 hours 5 minutes and have raised an incredible ￡2,918.75! I would just like to end my story with this: Life is an inspiration. Kindness will see us all along the way. Be kind to one another. Enjoy yourselves out there. And listen to Baz Luhmann – he has some great advice! Find out more about our lymphoedema services.